The dark blue squares and light blue striped squares are from Steve’s shirt. The blue squares with the red shapes – which are actually Clifford are from a pair of Eliott’s shorts. The white background squares with the pink paisley are from my Grandmother Amann. The rainbows are from one of Eliott or Paul’s crib sheets. The green and white stripes are from a strange suit my neighbor gave me. There is some pepper fabric from Steve’s shirt in here too. The center fuchsia plaid is from a cotton dress I wore for a long time. A couple of these I still have fabric from and cut squares from last week. Wow. 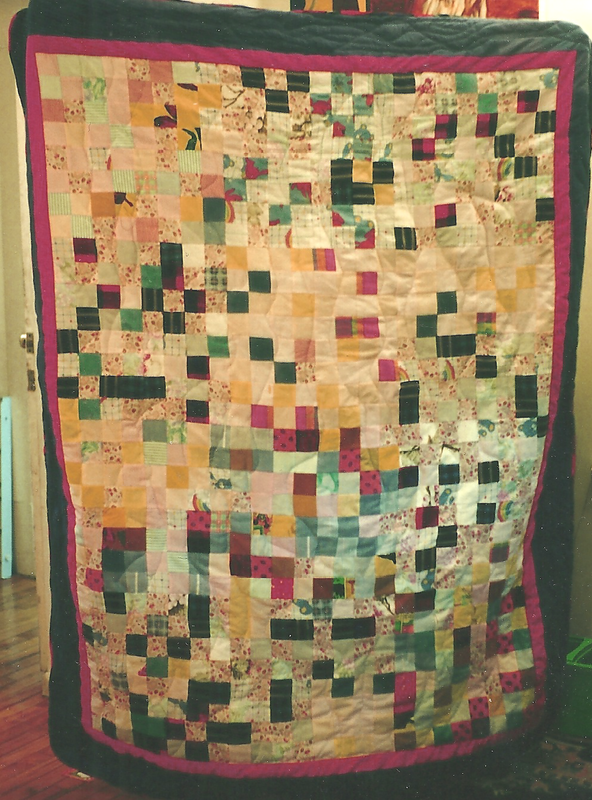 A line of quilts that goes back at least ten years. Thanks. I only wish I could have taken better pictures.